Criminal defence solicitors Carter Osborne instructed CYFOR to provide mobile phone forensics expertise in a murder investigation. The defendant was charged with the murder of an infant family member, who died due to internal injuries. The client stated that the deceased family member fell on ice and was then unresponsive a short time later. The prosecution suggested that the injuries were non-accidental and that the force used was equivalent to that of a fall from a substantial height or a road traffic collision. It was believed that the deceased family member may have been involved in a road traffic collision (RTC) about a week prior to their death. The RTC was not reported and was a line of enquiry still of interest. CYFOR were instructed to undertake forensic images of all the mobile devices and provide full downloads to include all incoming and outgoing calls and text messages, with a specific date range of interest highlighting separately. The instructions also included communications to and from certain individuals along with the extraction of photographs and videos, and a full trawl of social media accounts with regard to the suspected RTC. CYFOR’s in-house secure courier service collected the exhibits for transportation to our forensic lab. 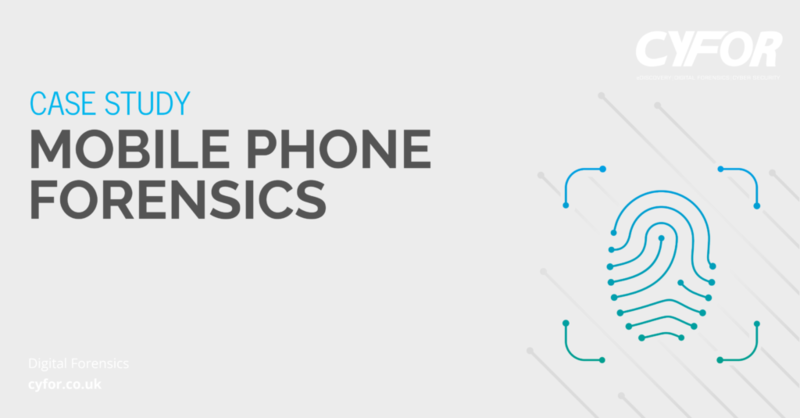 Our digital forensic investigators were then able to forensically examine the mobile phones. They created forensic images of each handset as well as creating reader files specific to each device. The investigators were then able to forensically download and analyse the Facebook account of the defendant and perform an open source social media investigation. They were then able to identify all appropriate digital evidence for the creation of a jury bundle and production of a report suitable for use in court.